A simple appetizer / starter salad with chicken and toasted peanuts. 1. Hard boil the eggs and cut them into quarters. 3. Mix the cabbage, lettuce, capsicum, cucumber, cherry tomatoes and spring onions in a bowl. 4. Add the coriander leaves, mint leaves, peanuts and red chilli. 5. Gently toss to mix well. 6. Mix the oil, soy sauce and fish sauce in a bowl. Add to the salad. 8. Top up with the quartered eggs and serve at once. 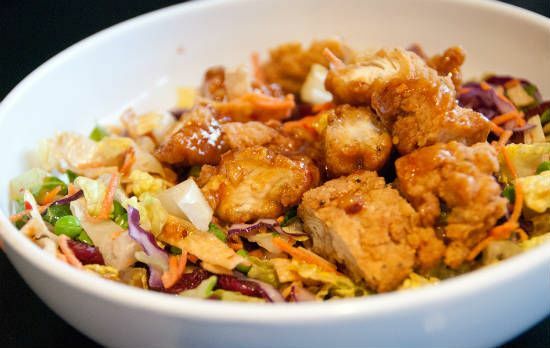 Feel free to comment or share your thoughts on this Peanut Chicken Salad Recipe from Awesome Cuisine.